I spent four days at a conference at the Lawrence University campus in Appleton, Wisconsin. We spent a lot of time in the student commons, and every time I walked to lunch, I had a great view of what was clearly a community garden across the road and down the hill. On the last day of the conference, I had an hour of free time and spotted people working in the garden, so I walked down and introduced myself. 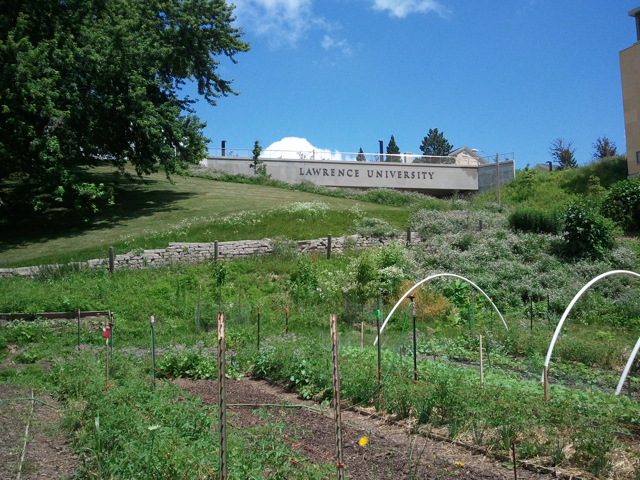 The Sustainable Lawrence University Gardens, as seen from the student commons. There are a number of things that make SLUGs a unique student group at LU. 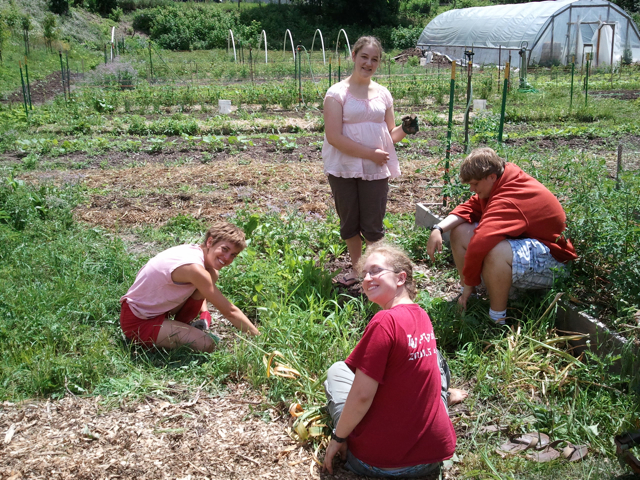 Many of the students who work on the garden live in a house where they cook together, often food from the garden. 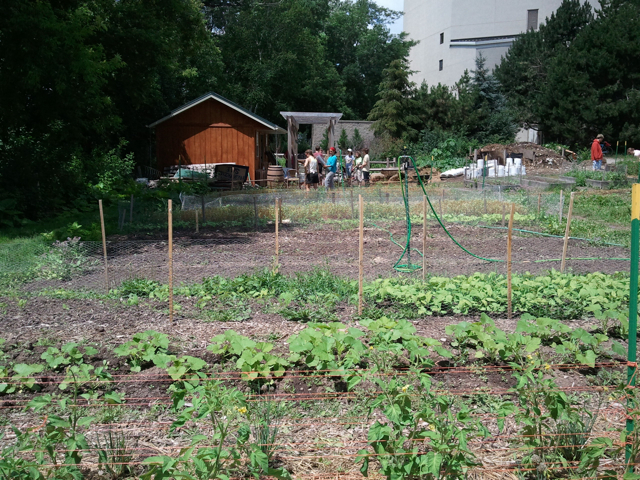 The gardens provide an educational program for LU student who want to learn about urban gardening and local food production. The gardens are also part of an experiment in students teaching themselves. And a recent grant now allows LU students to involve local high school via a summer work program. Finally, the university doesn’t have a formal academic agricultural program, and the garden fills that niche nicely. Rachel Graber, LU grad student (left), another LU student (foreground) and two local high school students in the back. Another thing that makes the SLUGs student group unique is that it is the only LU student organization that physically changes the campus landscape. 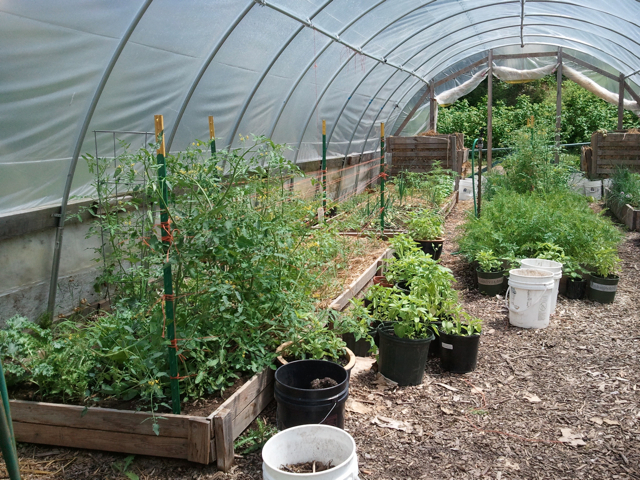 Since starting with the quarter-acre plot, the students designed and built a hoop greenhouse, improved the soil, build raised beds and started massive compost bins. “We get deliveries of food waste from the university food service several times a week,” says Rachel. Yes, the cafeteria. If you’ve read previous blog posts, I’m very interested in the idea of people working their gardens with a specific mission in mind. 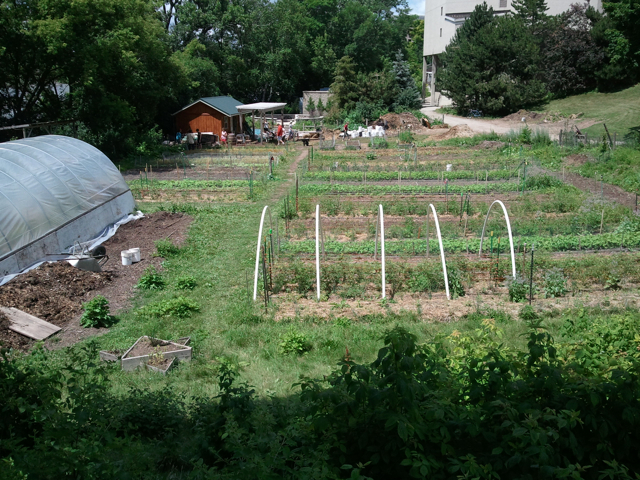 In addition to being a facility to teach and involve students in growing local food that the gardeners consume themselves, the SLUGs also sells produce to the university food service and the Appleton farmers market. Since the university food service is shut down during the summer months, SLUGs has a unique growing season to contend with. They don’t want to produce much of anything until school starts in early September. This means that the garden currently has a huge bed of basil that was just transplanted into the soil, each plant a mere three inches tall. The winter squash plants have just two or three “true leaves,” and the tomatoes are way behind what most Wisconsin gardeners expect in mid-July. With the plants at this stage, Rachel expects they’ll have plenty to consume themselves, sell to the university food service once it opens for the school year and sell at the local market. 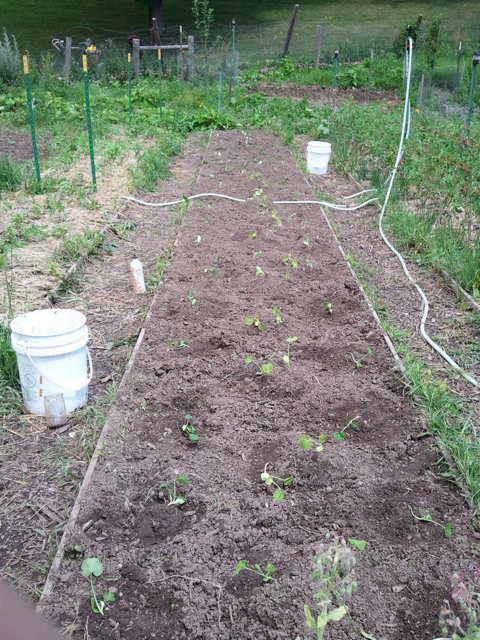 The food will just come in a lot later than for most Wisconsin gardeners. This is a sweet garden indeed. Thanks for bringing attention to these dedicated gardeners!